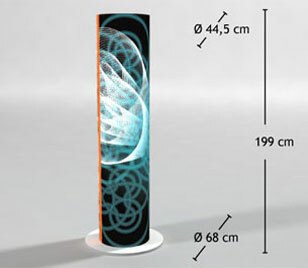 Lumaline Advertiser totem is a 360 ° luminous pillar which can be used as a free-standing display. The system consists of two sets with two round frames, one at the top and at the bottom, a transparent or opaque film with print which is mounted with velcro. Inside two energy saving light bulbs makes the pillar light up. The two sets are stacked together with a base for stability. Assebmed in a couple of minutes. No tools needed. Dimensions: 68 x 199 cm.